In each NBA new season there are some new changes of teams. There's no doubt that NBA LIVE will also hold a new brand season. Does it means all of your achievements will be removed? Absolutely not, it's not only a new start but also a lift to take your game to a upper level. Next, let's talk about the news about the SEASON SCORE 2017. It's a little frustrated that the coins won't make it to the next season of NBA LIVE Mobile. And also all extra players and any other items in your inventory will be also removed. In other words, your bench will be cleared (including sets). Finally all the progress you made in modes will be cleared. Such as Fans, Seasons, User Level, etc. The total things that will be changed are listed above. Don't worry about more. During Season Score, you'll still be able to do everything you've been able to do in the game up until this point, such as participating in leagues, purchasing packs, making transactions in the Auction House, and so on. In the current season of NBA LIVE Mobile, you will also be rewarded for your play and accomplishments. 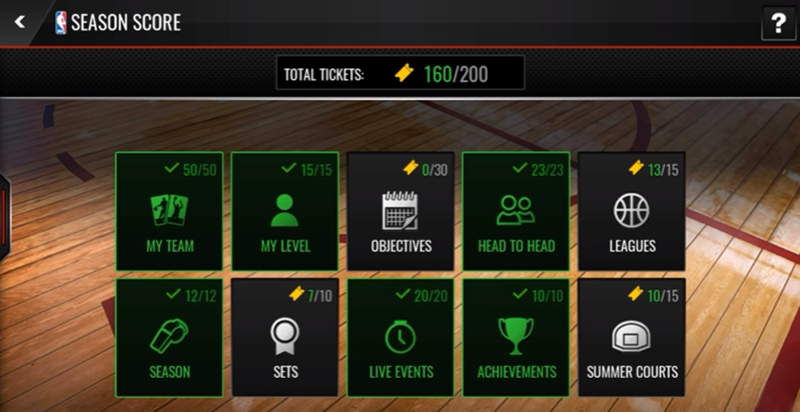 Each step will help you to enhance the SEASON SCORE since the first day you start NBA LIVE Mobile. Don't worry about your NBA Cash, you will be able to keep it, and also your group. When it comes to Leagues you can stays with them together. After the Season 1 ended the players in your lineups will stay with you, so you can play with them in Legacy Live Events in the next season. Season Score Starting on August 16, whenever you login to NBA LIVE Mobile you'll see a Season Score widget displayed on your Map. Tapping on the Season Score Widget will take you into the full Season Score Hub Breakdown. Season Score Hub is the vital part for everything your move, it will tracking your progress each step of the way. There are 10 different category panels on the Hub. Each of the category panels displays an icon, title, and tickets earned for the category.